Have you ever heard "Laugh and the world laughs with you?" Smiling and laughter are truly universal regardless of age, health, education or culture. When someone smiles at you, it's hard not to smile back. If someone else laughs, you find yourself laughing, too - sometimes so much so that your sides hurt, you can hardly breathe, and your cheeks hurt. That's called vigorous laughing. Is something that pleasurable good for you? You bet it is! What happens when you laugh? How is it good for you? Laughing triggers many physiological and psychological responses. When you're under stress, the body triggers certain hormones, like cortisol, that suppress the immune system. This increases the potential for infection, illness and poor health. These hormones also interfere with the function of certain white blood cells that fight tumor cells and viruses. Laughing has also been shown to lower blood pressure and increase blood flow. Taking deeper breaths increases the volume of oxygen delivered to the heart, lungs and brain. It has also been shown to impact blood sugar levels and might also be one of the most effective methods to manage pain by relaxing muscles. Vigorous laughing is an aerobic activity, like exercise, in that it causes the release of endorphins that produce a feeling of well being and help manage pain. Laughter also provides psychological benefits by reducing fear, anger and aggression. Some studies have shown that laughing 100 times in a row is equivalent to 10 minutes on a rowing machine or 15 minutes on a stationary bike. One might ask, "How does one laugh 100 times in a row?" Let go of your inhibitions of feeling silly and use your diaphragm to forcefully belly laugh out loud. (You might want to start this when you can be alone. Or watch a really funny movie or an episode of "I Love Lucy" or "The Carol Burnett Show." One of the best reasons to start laughing is because it helps you stay healthier - and it's free! No gym memberships or equipment to buy. Did you know there are laughter clubs forming all across North America through certified Laughter Yoga instructors? Laughing every day relieves stress, energizes the body, increases blood flow and oxygenation of the blood, boosts the immune system, influences blood sugar levels, reduces pain, makes you feel good, helps you cope AND it's free. So why not really laugh every day, even if you are alone? You'll be glad you did. Laughter really is the best medicine! 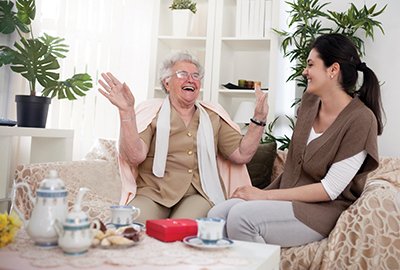 Rachel Carson is the owner of Home Instead Senior Care serving the Lowcountry since 1997.